While natural catastrophes weighed on our performance in 2018, they also underscore the critical role reinsurance plays in narrowing the protection gap and creating a more resilient world. By some accounts, 2017 and 2018 have been the costliest back-to-back years for insured catastrophe losses. As devastating as these events are, they also provide an opportunity to demonstrate the value of being reinsured. As always, we were there for our clients after hurricanes, typhoons, wildfires and hailstorms, fulfilling our promise to pay. Our clients recognise the financial strength of Swiss Re’s balance sheet and our ability to promptly pay claims. While natural catastrophes are nothing new, the future holds many unknowns. Technology and globalisation are breaking down barriers in business, politics and society, while creating new structures, new opportunities and new threats. 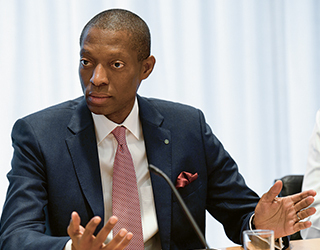 The strategy of Swiss Re’s Reinsurance Business Unit is focused on differentiation as well as the identification of risk pools – both existing and new – and the allocation of capital to those pools in a way that results in profitable growth. Reinsurance continues to prove its value by mitigating both established and emerging risks for businesses, governments and society. The global protection gap is expected to grow due to demographic changes as well as the increasing impact of natural catastrophes. Swiss Re expects longer-term economic and development trends to continue to generate additional business opportunities in both high-growth markets as well as those countries with more mature economies. We leverage technology to understand risks better, improve our underwriting processes and pricing and to increase efficiency. Proactive risk management in the form of reinsurance offers protection when the unexpected happens and provides the security and predictability to attract investment in innovation and infrastructure. This translates into tangible benefits for individuals across a wide range of sectors, such as housing, food security, financial wellbeing and healthier lives. Swiss Re provides protection for clients from risks in these and other areas. Core is our traditional business and typically involves the transfer of insurance risk from a client’s balance sheet to our own. Transactions are usually driven by a client’s balance sheet needs, which necessitate the deployment of our knowledge and capital to deliver innovative deals. Our Solutions help clients add value to their underlying business, often by leveraging technology.